Sep 18 Gatsby? What Gatsby? Sunday is easily my favorite day of the week. Usually you're already done with weekend errands and are resting from the night before, so Sundays are super casual and laid back. What am I saying, most days in Austin are super casual and laid back! For this past Sunday Chris and I watched some football and drank sangria at Red's Porch here in South Austin, wandered around on SoCo, and topped our day off at one of my favorite new hangouts, Radio Coffee & Beer. We love going here to grab a drink of sorts and play card games for a few hours (Spite & Malice is our fav!) 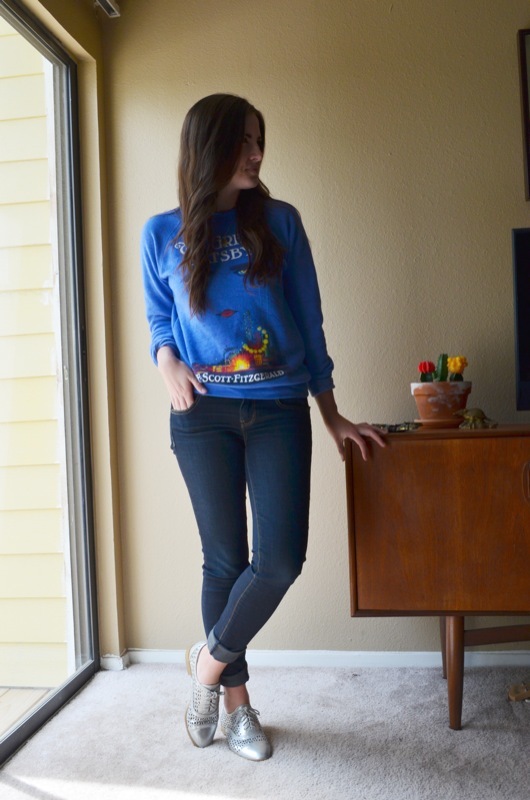 This crew neck Great Gatsby sweater was perfect since the temperatures dropped slightly. I paired it with a simple Texas charm necklace and these beautiful silver oxfords I purchased at Target for $8.